The long and noble history of the harp and its music notwithstanding, there is still a lack of classical ensemble pieces to share the honours with so many masterpieces of recent years. Following Debussy, an attractive configuration is the trio which conjoins the harp with flute and viola to yield gratifying sonorities. In quartet form, KV80 barely scrapes into the volume of “little Mozarts” when there are so many of his great works in the genre from which to choose. As an amateur cellist I have never played it; neither does it figure in most professional programmes. This is because the young Mozart writes largely in one or two melodic parts plus accompaniment, whereas we have become spoiled by the great quartets in which the four parts are of equal thematic and contrapuntal interest. However, this apparent weakness of this Quartet has proved a source of strength for my Trio. 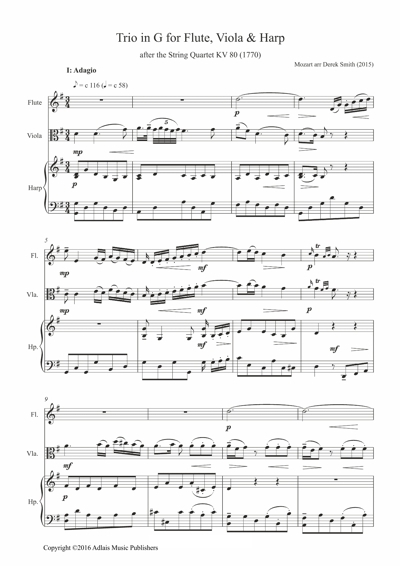 While a gentle introductory work in a chamber concert, popular with audiences, the piece as here arranged is easy enough for use in schools wherein violin may be substituted for the viola and piano (or, better, harpsichord) for the harp. It is suggested that any performance should respect Mozart’s repeats, lest ‘gossamer' should fade into ‘insubstantial’. 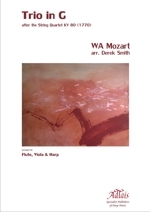 Adlais Music Publishers are very grateful to Catherine Baker for her kind permission to use this image of her painting “Red Earth and Pink” on the front cover of this score.